With this project I had a brief to make a tool box that would fit on a standard trailer. 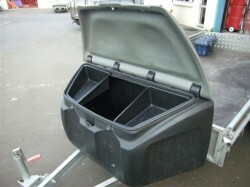 It should be lockable and able to fit a 10 litre fuel container, have removable trays, attractive and easily fitted to the trailer. I designed it with integral hinges that interlock and integrated catches for durability and cost saving. I also designed the tool so that the removable trays could be formed within the same mould as the box, utilising the waste material that would normally be cut out to form the box opening. "Our company has worked with Kevin over the past 27 years with outstanding creative and practical results. The attention to detail is second to none and the design ideas have meant that product made a number of years ago are still in production. I have no problem in recommending Kevin to anyone that requires modern solutions to product design and mould making skills"